Solvay Specialty Polymers, a leading global supplier of high-performance polymers, announced recently that Vertera Spine, a pioneer in advanced functional surface technologies for spine applications, chose its Zeniva polyetheretherketone (PEEK) polymer to develop PEEK Scoria, a novel porous surface technology for stable, cost-effective intervertebral joint fusion. 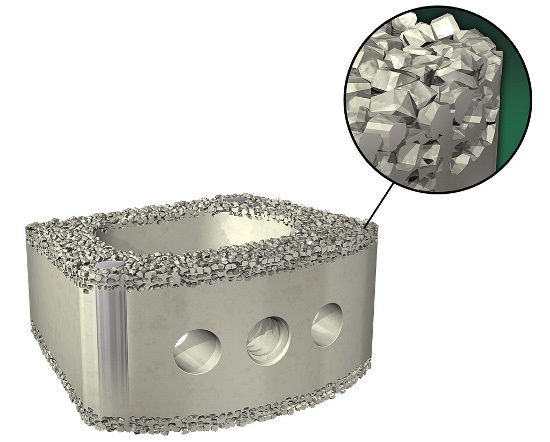 The porous character of Vertera Spine’s biomaterial facilitates integration of bone tissue with the company’s COHERE Cervical Interbody Fusion Device. Offering excellent biocompatibility, toughness and fatigue resistance, as well as a modulus very similar to bone, Zeniva PEEK proved to be a key enabler for this breakthrough medical device. Both companies are showcasing the technology at Solvay’s booth (#1483) during the North American Spine Society (NASS) meeting in Chicago, from Oct. 14 to 17. Backed by extensive research at Duke University and the Georgia Institute of Technology, Vertera Spine’s PEEK Scoria innovation represents a significant leap forward in how surface treatments are applied to intervertebral joint fusion devices. Where conventional approaches coat the fusion device, this surface treatment is grown directly from the bulk PEEK material that comprises Vertera Spine’s COHERE system. Solvay’s Zeniva PEEK comprises both the porous surface technology and the device on which it is grown. By growing PEEK Scoria directly onto the device, Vertera Spine eliminated the need for additive materials, which significantly lowered the manufacturing costs of its device vs. metal-coated implants. This makes its COHERE solution competitive with current PEEK device offerings and more cost effective than titanium-coated fusion devices. The porous features of the PEEK Scoria surface technology are specifically engineered to facilitate bone tissue in-growth. The surface material features 300-µm average pore size, layer thicknesses greater than 500 µm, over 99 percent interconnectivity and a wettable surface. Pre-clinical testing indicates that bone can infiltrate within these pores and form direct contact with the PEEK Scoria surface, which improves how PEEK devices interact with bone. In addition, because Vertera Spine’s COHERE device and PEEK Scoria surface treatment are uniformly comprised of Solvay’s Zeniva PEEK, the technology will not generate visual artifacts when medical imaging is applied, allowing surgeons to easily assess the fusion site. Solvay’s Zeniva PEEK is part of its Solviva Biomaterials portfolio, which is offered for use in implantable medical devices. The biomaterial boasts a modulus very close to that of cortical bone plus excellent biocompatibility, toughness, and fatigue resistance. Vertera Spine is a privately held medical device company working to develop and commercialize a portfolio of surgical solutions that use or complement its patented porous surface technology to address critical clinical needs in spine procedures. The company has received grant funding from the National Science Foundation and Georgia Research Alliance to translate its growing technology portfolio into commercial products. For more information, visit www.verteraspine.com. Solvay Specialty Polymers manufactures over 1500 products across 35 brands of high-performance polymers – fluoropolymers, fluoroelastomers, fluorinated fluids, semi-aromatic polyamides, sulfone polymers, aromatic ultra-high performance polymers, high‑barrier polymers and cross-linked high-performance compounds – for use in Aerospace, Alternative Energy, Automotive, Healthcare, Membranes, Oil and Gas, Packaging, Plumbing, Semiconductors, Wire & Cable, and other industries. For more information, visit www.solvayspecialtypolymers.com. As an international chemical group, SOLVAY assists industries in finding and implementing ever more responsible and value-creating solutions. Solvay generates 90% of its net sales in activities where it is among the world's top three players. It serves many markets, varying from energy and the environment to automotive and aeronautics or electricity and electronics, with one goal: to raise the performance of its clients and improve society's quality of life. The group is headquartered in Brussels, employs about 26,000 people in 52 countries and generated 10.2 billion euros in net sales in 2014. Solvay SA (SOLB.BE) is listed on in Brussels and Paris.